Are you looking for a First Aid Kit Checklist? There are so many options and so much that could be in a kit. Is it for the car, home, boat, holiday or overseas travel? What are the likely accidents or injuries that you may encounter? Maybe the first aid kit is needed for a group activity. What activities will the group be doing? "Lazing" around listening to lectures or doing extreme sports? Depending on what you are wanting the kit for and the amount of people it needs to cover, will influence the size of the kit and the type of container you store it in. A tackle box makes a good first aid kit container or it can be as simple as a resealable clip lock bag. Where you keep the kit will also influence its size. So where will you store the kit? Your First Aid Kit should always be kept in an area where it can be easily found and accessed. Bottom line - a first aid kit needs to suit what you need it for. Basic First Aid Kit - A basic first aid kit doesn't need to include every piece of First Aid equipment though it might as well have basic yet useful content. Motor Cycle First Aid Kit - A Motorcycle First Aid Kit has special needs. An ordinary first aid kit just won't cut it. They need a different balance of first aid content. Check out our Motorcycle First Aid Kit Checklist. 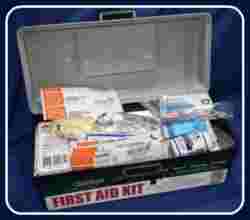 Marine First Aid Kit - If you get injured on a boat you may not be near help. You need to be able to treat yourself and your shipmates for any emergency that might arise. You will be set for almost any boating injury with this Marine First Aid Kit Checklist. Wilderness First Aid Kit - We have put together a wilderness first aid kit checklist which is the minimum of what you should be taking with you. It will help you put together a first aid kit that will tackle many injuries and ailments that might come your way while in the wilds. Backpacking First Aid Kit - When going backpacking taking a first aid kit is a must as you can't always find a doctor near by. It is vital to be prepared for emergencies. Check out our backpacking first aid kit checklist. Also there are questions for you to answer that will help narrow down what is crucial to pack in the first aid kit. Hiking First Aid Kit - Never be complacent when packing for a hike and always carry a hiking first aid kit with you. The one time you don't will be the time you need it. We’ve created a list of some important safety items to consider when putting together your own hiking first aid kit. Vehicle First Aid Kit - It makes sense to have a Vehicle First Aid Kit on hand for accidents you may come across while travelling on the road. You may need to deal with injuries ranging from bruises, cuts and scrapes, to moderate injuries, such as broken bones. Then there are the more serious, life-altering injuries like severe bleeding, or even an unconscious person where you may need to do CPR. Be prepared. Remember to always check medication expiry dates and replace outdated items in your kit. Store the kit out of the reach of little ones who might find it an interesting play thing to explore. Know how to use the items in the kit - Become familiar with a first aid manual you find easy to understand so that you will not be scrabbling to learn something from scratch but will be able to scan instructions to remind you what to do. Keep your first aid manual with the first aid kit at all times. If you have not done a First Aid Training Course, FirstAidAnywhere.com strongly recommends that you either do a course in your local area or online. The course you choose should include performing CPR, First Aid for Cuts and Scrapes, how to stop bleeding, how to stabilise a fractured limb, and how to treat burns, snakes, spiders and insect bites as well as how to treat other injuries.